The Texas Association for Court Administration (TACA) was organized to encourage and promote continuing education and maintenance of professional standards for Court Administration and to aid in identifying the individual needs of the Courts and their administrative personnel in improving the administration of justice. 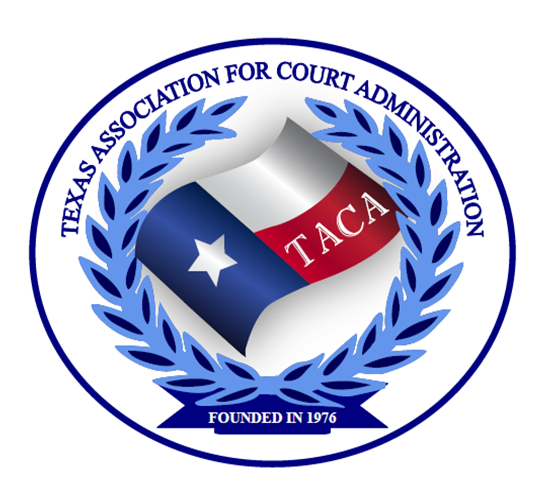 Founded in 1976, the Texas Association for Court Administration (TACA) helps render special and general services which individual court administrative court personnel have neither time nor expertise to do alone. We foster and organize schools, conferences and meetings of Court Administrators, and other administrative staff employed by the Court System of the State of Texas, for the practical study of matters pertaining to Court. TACA helps provide the judiciary with a plan for the professional education and development of persons employed courts within the State of Texas as coordinators, and administrators in Texas trial courts. These programs provide for the certification of such persons upon the successful completion of a prescribed curriculum. Additionally, we promote the profession of court administration among State governmental agencies and officials to secure the administration of justice by providing efficient management and coordination in the trial courts of the State of Texas. September 4, 2019, to ensure federal rate of $126.00 per night for single or double room. Rate is based on current GSA Per Diem and is subject to change. I. A full refund of fees paid will be authorized when a written request for cancellation of conference or program is received by the TACA Secretariat at least 31 days prior to the scheduled start of the program. II. A refund of 70% of the fees paid will be authorized when a written request for cancellation of conference or program is received by the TACA Secretariat more than 5 days but less than 31 days prior to the scheduled start of the program. III. A refund of 30% of the fees paid will be authorized when a written request for cancellation of conference or program is received by the TACA Secretariat less than 5 days prior to the scheduled start of the program. IV. If no cancellation in writing is received by the TACA Secretariat and no payment has been received 5 days prior to scheduled start of the program. You will be charged 100% of the cost of registration fee. V. No refund will be given for participants that do not attend the program and no advance notice of cancellation is received. VI. Substitutions may be made for persons that are unable to attend. Advance notice is requested. VII. The TACA Board may make exceptions to the refund policy in the event of an emergency that prevents the participant from attending as scheduled.